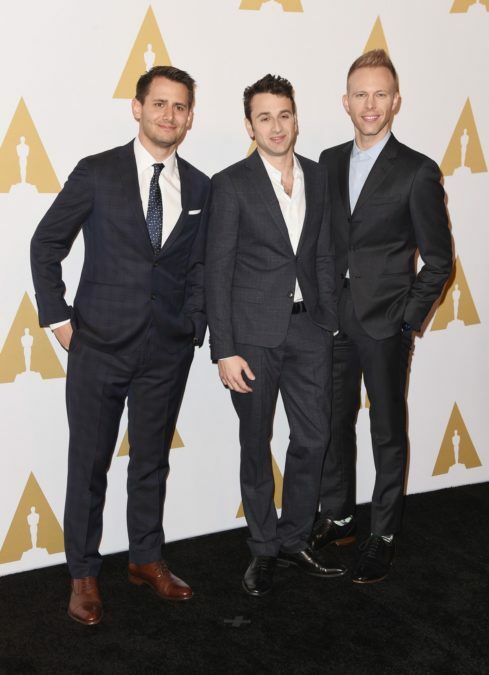 Benj Pasek and Justin Paul have nabbed their first Oscar! The Dear Evan Hansen music duo won for the La La Land song “City of Stars.” They share the win with La La Land composer Justin Hurwitz. The trio also garnered the Golden Globe back in January, when "City of Stars" won Best Original Song. "This award is dedicated to all the kids who sing in the rain and to all the moms that let them," Pasek said in the speech. Pasek and Paul created the music and lyrics for Broadway's Dear Evan Hansen. They also lent their musical talents to A Christmas Story. Their musical Dogfight premiered at the Second Stage Theatre in 2012 and garnered the Lortel Award for Best New Musical. Their other stage works include James and the Giant Peach and Edges. On screen, their music has been featured in Smash, Sesame Street and Johnny and the Sprites. They are also working on Hugh Jackman's movie musical, The Greatest Showman. Congrats to Pasek, Paul, Hurwitz and theater nerds everywhere!